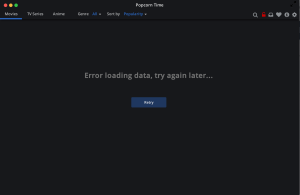 Popcorn Time is a p2p media player that is famous for offering the latest TV shows and movies directly from torrent sources. With its Android version released last year, its evolution continues as its Mac edition is now available, which is really a piece of good news for movie bonkers running on Mac. Given this, this guide will focus on how to download Popcorn Time on Mac to free stream copyrighted materials on the Apple's ecosystem. In addition, you are also introduced with the best alternative to download movies and TV shows flawlessly on Mac (including iMac 5K, Retina Macbook Air/Pro) just in case you run up against Popcorn Time not working issues. • 100% safe to download full-length movies, TV shows, music, videos, soundtracks for free. • Support as many as 300+ sites, including YouTube, Facebook, Dailymotion, Vevo, Vimeo. • Download 4K UHD, 3D videos, Blu ray movies on Mac (OS X 10.6 and above, including El Capitan). • Convert downloaded movies for playing on Apple, Android, Google, Microsoft devices with no.1 fast speed. Before the guidance of downloading Popcorn Time Mac version, you need to bear in mind that the official site indicates it is only available for Mac OS X 10.7 and above, that means if you are running on Snow Leopard or earlier Mac, installation will be a failure. Step 1: Visit its official page https://popcorntime.io/, go straight forward its Mac edition and hit the download button. After you get the dmg file on your Mac computer, install it. Step 2: Open the downloaded app and select a movie or episode of any genre, from Sci-fi movies to animated flicks. Step 3: Select video quality (720p or 1080p) and choose subtitles for the movie. Step 4: Click play and enjoy the movie or TV show. Movie won't start or playback is stuttering: Popcorn Time helps to download files on your Mac with the aid of Bittorrent protocol while playing them at the same time, which means you can download the popular contents at high speeds for smooth playback but have to be patient in case you stumble upon some virtually unknown stuff, leading to annoying choppy playback on your Mac or no sound issue. 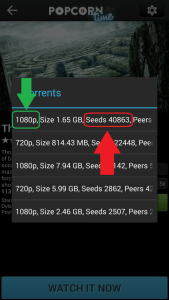 To tackle the issue, you can just try another source/torrent, look for high numbers of peers. Or else, go do something else after you press pause and resume playback afterwards. If these solutions won't work for you, just try third-party software like YouTube downloader for Mac. "error loading data": "Hi , i was using popcorn time with osx maverick but now that i put osx yosemite tells me that the navigator doesn't support the movie or video and that is damaged, so i downloded chrome and deleted an installed it again but after thre minutes of film it pauses and says its not working." 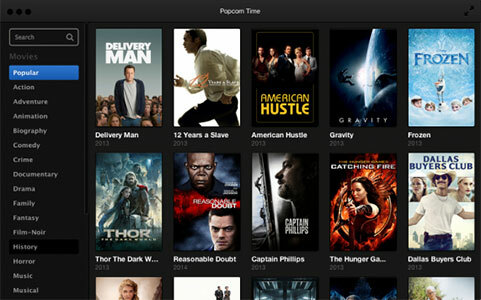 Popcorn Time for Mac apps on this website are beta-versions, which means they're still under development. Plus, it is often caused by the misconfigured system files that create registry errors within your Mac OS. So you may run into problems like the "error loading data, try again later" message when trying to load the menus. That's why OS X users constantly suffer from no audio or are told the movie is damaged. If you come across the problems, you are advised to shut down the app and start it up again; restart your Mac computer; or remove the app, redownload and install it on your Mac again. The above mentioned issues can be tackled by following the tips aforesaid. But there are still many other problems when running this movie streaming app, such as bandwidth issues, CPU problem, copyright issue, legality, and possibility to bring about virus, malware or similar to computer. So you have to turn to a Popcorn Time alternative for help. MacX Video Converter Pro is a YouTube downloader that is able to download movies and TV shows in 720p HD, 1080p HD or even 4K 8K UHD video quality. It is fully compatible with Mac OS X Snow Leopard and above, including the latest OS X El Capitan. Better than the the movie streaming app, it is also versed in converting the downloaded YouTube movides, TV shows, episodes, etc to MP4, MOV, FLV, AVI, WMV, etc for playback on the mainstream devices with intact quality and 83X faster speed. Step 1: Find the movie/TV show you want to download from YouTube and add the URL address. Step 2. Click "YouTube" button such that the built-in YouTube Downloader window pops up automatically, "paste & analyze" the URL, and choose output video resolution. Tips: this Popcorn Time for Mac alternative helps to download videos including 4K UHD video with high quality and output video in MP4, FLV and WebM. Plus, you can check the box "autio add to convert list" such that you can convert the downloaded movies to other formats like AVI, MOV, WMV, MKV, etc and transfer them to the latest mainstream devices, covering iPhone 6S, iPad Pro, and more. Step 3: Hit "Download Now" to begin downloading. Note: MacX Video Converter Pro has edge over Popcorn Time for Mac as it is not only a YouTube downloader to save videos on Mac OS but also works as a video converter that makes the downloaded YouTube movies and TV shows fully compatible with your mobile devices. Whether you want to watch YouTube videos on the latest iPhone 6S/Plus or the newly released Galaxy S6 edge+ with no network connection, it makes it happen a few clicks as it supports downloading YouTube videos to 350+ mainstream devices.